Wortham is a fishing village in Khanduras close in size to Tristram, located not far away from the infamous village and close to the Festering Woods in Act I. The villages winding streets of cottages are all ablaze and the few residents still alive rush towards you begging for your help. At the back of the town its chapel is also engulfed in fire but there is access to its cellar from the side. As soon as you land in Wortham. After killing Urzel Mordreg outside the Wortham Chapel. 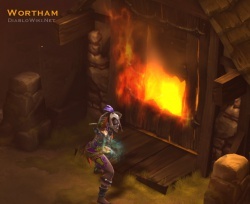 After returning to Tristram through the Wortham Waypoint. After the cutscene at the end of the quest. Just outside the entrance to the Caverns of Araneae. Waypoints are special plates on the ground that form a network of jump points allowing players to instantly teleport between them. 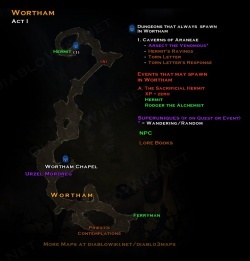 The nearest waypoint for Wortham appears at the back of the Wortham Chapel Cellar. Wortham is in some way involved in the following achievement(s). This page was last edited on 27 September 2014, at 09:41.